On July 1, 1888, the board of directors of the famous Grand Hotel at Mackinac Island held their first meeting and the minutes show that Cornelius Vanderbilt said: “We now have the largest, well-equipped hotel of its kind in the world for a short season business. Now what we need is a bridge across the Straits.” The great Firth of Forth Bridge in Scotland was under construction then and completed in 1889. 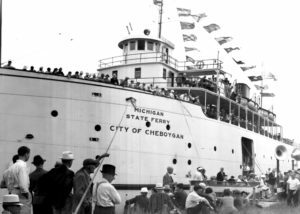 During the ensuing years there were a few farfetched ideas about the connection of Michigan’s two peninsulas. In 1920 the state highway commissioner suggested a floating tunnel. He invited other engineers to suggest ideas for crossing the Straits. Mr. C. E. Fowler of New York City came forward with an ambitious project to solve the problem with a series of bridges and causeways that would start at Cheboygan, some 17 miles southeast of Mackinaw City, traverse Bois Blanc and Round Islands, touch the southern tip of Mackinac Island, and leap across the deep channel at St. Ignace. “Early in 1934 the matter was again revived and proposed as a suitable P.W.A. project. 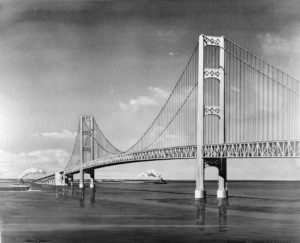 In the extra session of 1934 the Legislature created the Mackinac Straits Bridge Authority of Michigan and empowered it to investigate the feasibility of such construction and to finance the work by issuance of revenue bonds. The Authority began its studies in May 1934 and has been continuously active since that date. Again, the bridge backers swung into action and a citizens’ committee was established to obtain legislation recreating a bridge authority. By 1950 the legislation was enacted, but it limited the newly created Authority to determine feasibility only. The law required the Authority to consult with three of the world’s foremost long span bridge engineers and traffic consultants for advice on physical and financial feasibility. 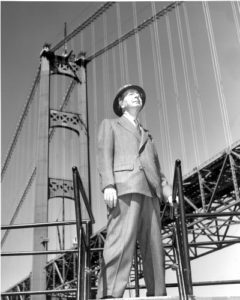 The five-mile bridge, including approaches, and the world’s longest suspension bridge between cable anchorages, had been designed by the great engineer Dr. David B. Steinman. Merritt-Chapman & Scott Corporation’s $25,735,600 agreement to build all the foundations led to the mobilization of the largest bridge construction fleet ever assembled. The American Bridge Division of United States Steel Corporation, awarded a $44,532,900 contract to build this superstructure, began its work of planning and assembly. In U.S. Steel’s mills the various shapes, plates, bars, wire and cables of steel necessary for the superstructure and for the caissons and cofferdams of the foundation, were prepared. 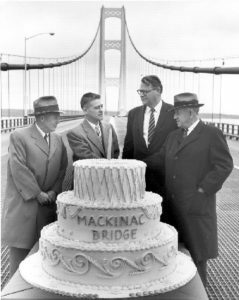 The bridge was officially begun amid proper ceremonies on May 7 & 8, 1954, at St. Ignace and Mackinaw City.